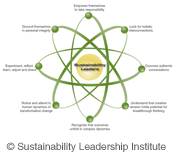 Below, you'll find information on some of the fundamentals and tools for building sustainability and enhancing leadership skills in this crucial area of sustainability, along with links to more information on them. We want to provide you with as many resources as possible as you go through our workshops and then into your communities to help build sustainability and relationships with others. Clicking on the links to the left will take you to our Links page, where you'll find helpful online information and resources. Documents from our workshops and other materials can be downloaded in PDF form on the Documents page. As always, we'd love to hear from you if you have suggestions for further resources we can include here. To the left is also a link to the NSLW Network, the growing group of civic leaders and sustainability experts throughout the state who share ideas, information, and solutions with regard to issues of sustainability. Further, in the communities of the future these domains should be the organizing principles for administration, design and planning, growth management, and regional and sustainable development. The domains, and all the information contained within them, are interdependent, interactive, and affective, one in turn upon each of the other four. A systematic analysis of their interdependencies, in any developmental or operational situation, will reduce the potential of unintended, unanticipated consequences, at any scale of development. Read more about The Five Domains here >>. In an ideal world, an indicator (for example, water quality), plotted near the outermost ring of each term scale would be considered, or judged to be approaching the best possible outcome or condition for sustainability. In this example, short-term conditions appear to be approaching optimal, yet the relative immediacy of medium and long-term measures indicate water quality challenges that lie ahead. For further detail, the dots plotted on the scale can be color-coded and sized according to the urgency or scale of the challenge of that particular indicator. The EcoSTEP® tool allows any user to assess hypothetical yet real life situations, or real conditions of design or planning intent, to assess the assumptions for consequences and trade-offs, and to communicate those situations to stakeholders and leadership. By incorporating all five domains the tool is effective both in gauging progress and in revealing the various and complex trade-offs that will occur between indicators. 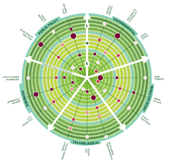 This graphic representation of issues and conditions makes EcoSTEP® an ideal tool for collaborative planning as well as for communicating to leaders and the public a region’s progress toward a sustainable vision and quality of life goals. 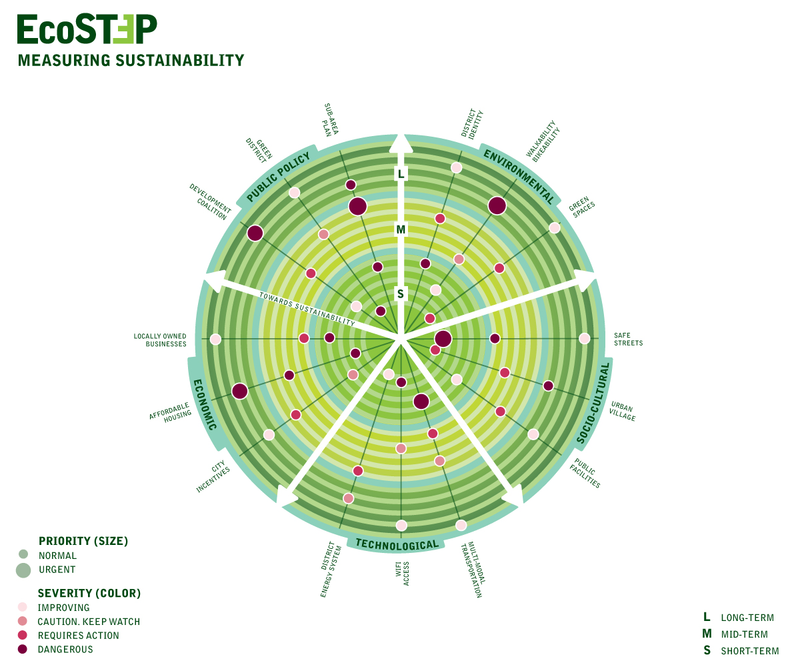 W. Cecil Steward of The Joslyn Institute developed EcoSTEP®, and he has applied the tool to a diverse range and scales of built-environment projects, including individual buildings, neighborhood contexts, small communities, districts within cities, and to large regions. In redefining leadership for a sustainable future, Mary Ferdig of the Sustainability Leadership Institute, has devised a holistic set of principles to help community leaders enhance their skills. A sustainability leader is anyone who chooses to engage in the process of creating transformative change with others aimed toward a sustainable future: economically, environmentally and socially. Traditionally, leaders are often thought of as those who inspire a shared vision, build consensus, provide direction, and initiate change to ensure successful outcomes. The assumption is that leaders are the "wise ones" and, therefore, have an enlightened view about what direction, outcomes, and ways of engaging are required for success. They often rely on their charismatic ability to persuade followers to engage in actions that serve to bring their visions to life. In turn, people tend to look to their leaders for direction, guidance and answers. They often are willing to defer to "those in charge" rather than act from a position of courage and self-authority that honors their own views in relation to others. This perspective of leadership, and assumed follower response, is deeply engrained in Western culture. However, things are changing. 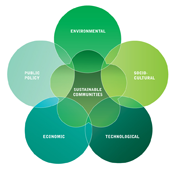 In contrast to traditional assumptions about leadership, sustainability leaders focus on how members of the human community, individually and collectively, create changes that make sense for long-term prosperity and survivability. Developed from a deeper understanding of individual responsibility and conscious action/interaction within a network of individual who share a common identity (e.g. members of an organization or community who share common challenges), the model of sustainability leadership does not assume that any single individuals have the answers or "know the way". Instead, the model assumes that ordinary, everyday people—some in formal positions of power, others not—seek to expand their understanding of the challenges they see and share with others and develop a shared view of a viable pathway to create the future they want. They then generate and enact reasonable solutions that can work for them—all within the context of their ongoing interactions with each other as a community of responsible, active individuals. 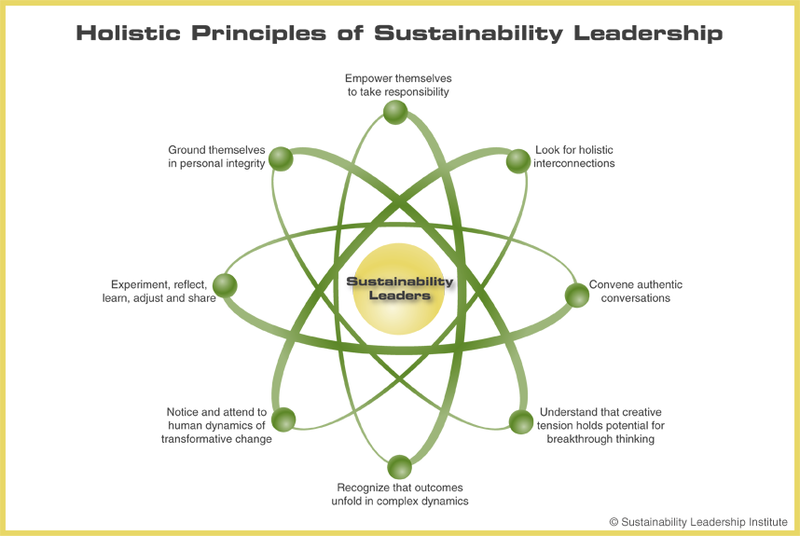 Sustainability leadership is not prescriptive; leadership actions and the outcomes they produce emerge in the context of continually changing dynamics. This notion of leadership requires paying attention to what is going on in each particular situation, and then figuring out what to do next in the context of a holistic picture that is shared by others. Leaders who operate from this frame of reference seek to build individual and collective capacity (human capital) for dealing with complex challenges. They continually uncover and nurture the leadership potential within themselves and others around them, which is necessary to move toward a sustainable future. This view of leadership is characterized by a set of principles and related capabilities generated through the Sustainability Leadership Institute's ongoing research and development activity. Read more about these principles and capabilities.